Thought I’d share the XMas card that I made for my husband this year. He thought he was getting a really romantic card when he saw the front of it!!!! He was wrong, but he really laughed when he saw the inside. To make the card I used Recollections – Winter 4.25 in x 5.5 in (10.7 cm x 13.9 cm) card for the base. 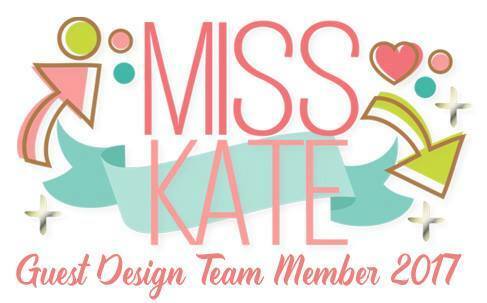 The deer are from Miss Kate Cuttables – Birch Trees with Deer. I used Cricut Design Space and the Cricut Explore to cut it out. Glitter Paper is – Recollections Christmas Ink Jet Printable Glitter Paper. I stamped Merry Christmas with Memento Ink. For the inside – Used stamp from Hampton Art – Art Impressions – SCO715 – Christmas Reindeer Games. Stamped image with Memento – Tuxedo Black ink. Coloured with a mixture of Copics and Spectrum Noir Alcohol Markers. Then used Wink of Stella – Clear on the Christmas tree balls and earrings. 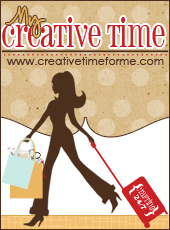 Cut frame out with Craftin Desert Diva’s – Fancy Frames. Used Sharpie Gold – Medium Point for going around frames on both the front and inside of card. 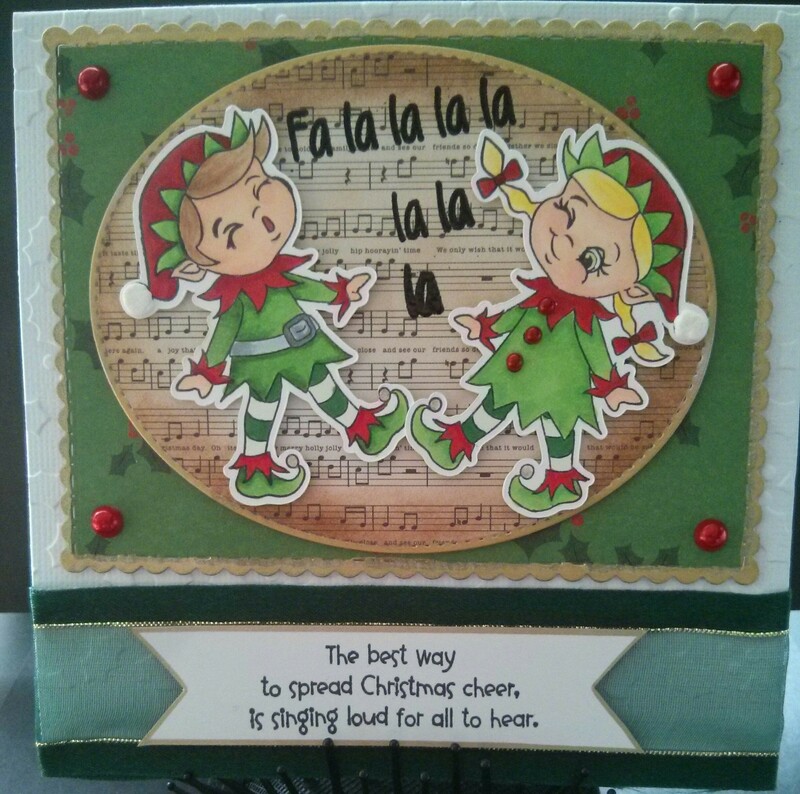 Back to share a couple of singing elves cards that I made. 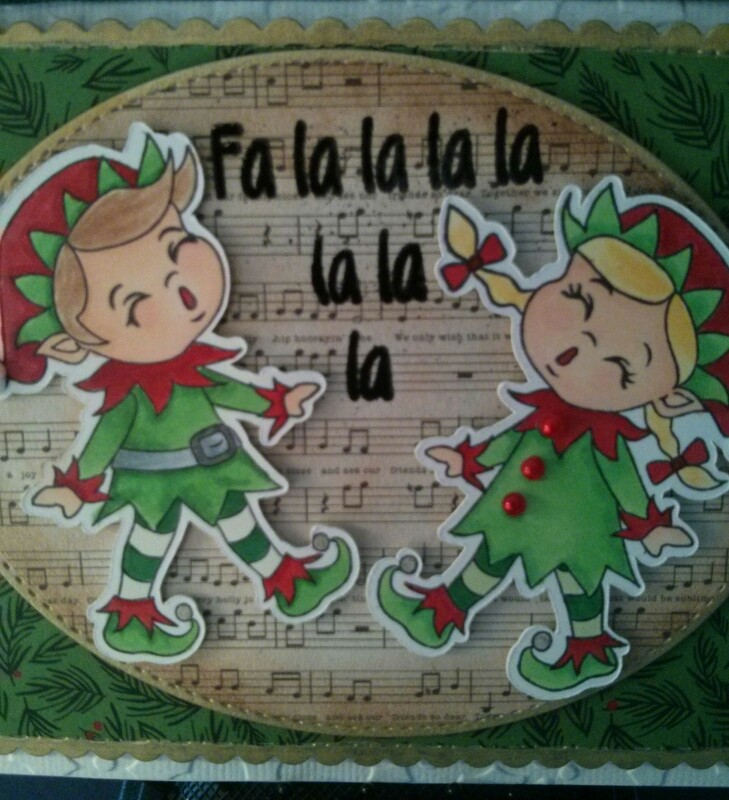 Used my Cricut Explore and Cricut Design Space to cut out the images for the elves using an .svg cut supplied by Peach Keen stamps when I purchased the set. Stamped the images with Memento Tuxedo Black ink. 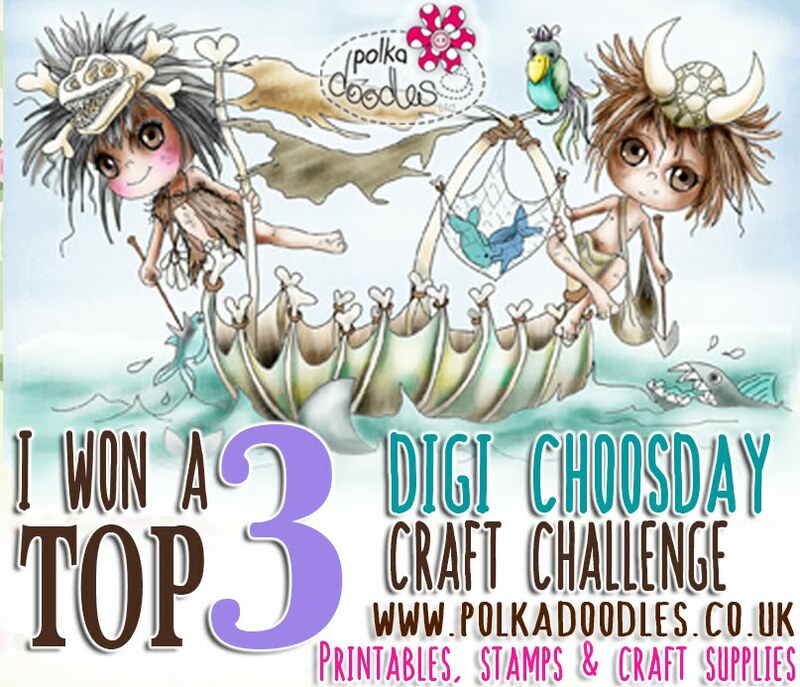 Peachy Keen Stamps – PKSC-31 July 2014. I coloured them in with a mixture of my copic markers and Spectrum Noir Markers. The “Fa la la la la” is heat embossed with VersaMark and Ranger Super Fine Detail Embossing Black Powder. Stamp is from Craftin Desert Diva’s “Rudy”. Oval frame if from: Die-namics – Exclusive Designs for “My Favourite Things”. Scalloped frame is from Craftin Desert Diva’s – Fancy Frames. Gold around frames – Sharpie – Gold Medium Point. Around oval – Tim Holtz Distress Ink – Vintage Photo. White cardstock and some green and gold ribbon. 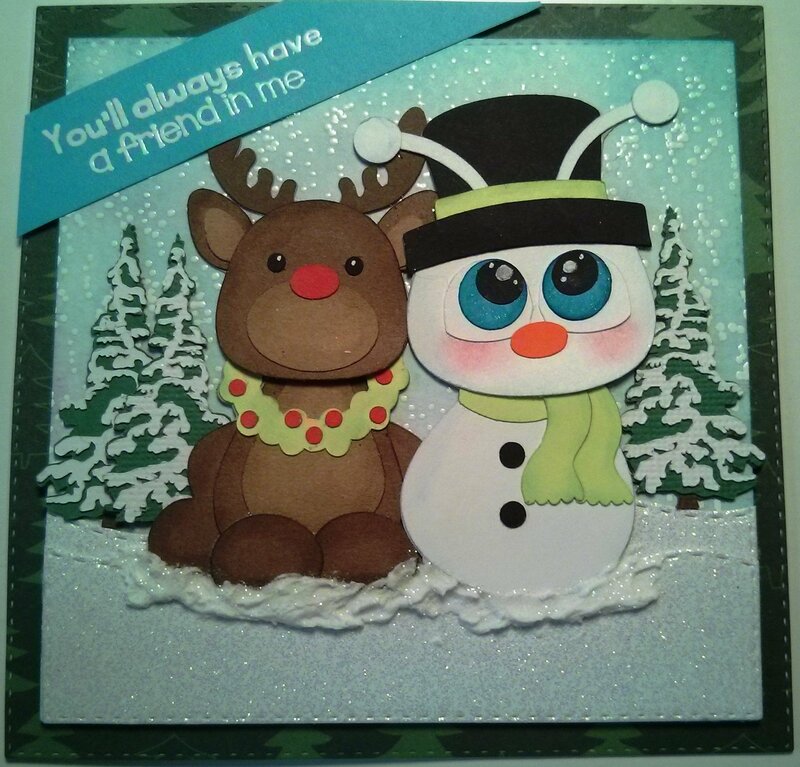 Back again to share a card that I made using High Hopes Rubber Stamps Polar Hug SS001 by Dina Gerner. Loved this stamp the moment I saw it. Stamped the image with Memento – Tuxedo Black ink and then cut it out. For the background I used watercolour paper and used various colours to try and create the Northern Lights. I then used Tim Holtz Distress Inks – Black Soot, Peacock Feathers, Tumbled Glass, Shaded Lilac, Dusty Concord and Broken China. To colour in the image I used Copics – BG05, B05, BG15 and B24 on the hat and scarf. Penguin – Spectrum Noir – IG3, IG5, IG7 and Copic 100. Feet and beak, YR07. Pompom, Liquid Applique. Wink of Stella – Clear on scarf and hat brim. Polar Bear, Blue shadow – PC904 – PrismaColor Premier and Gamsol. Tongue – Copic R37. Nose – Sakura Gelly Roll 06. 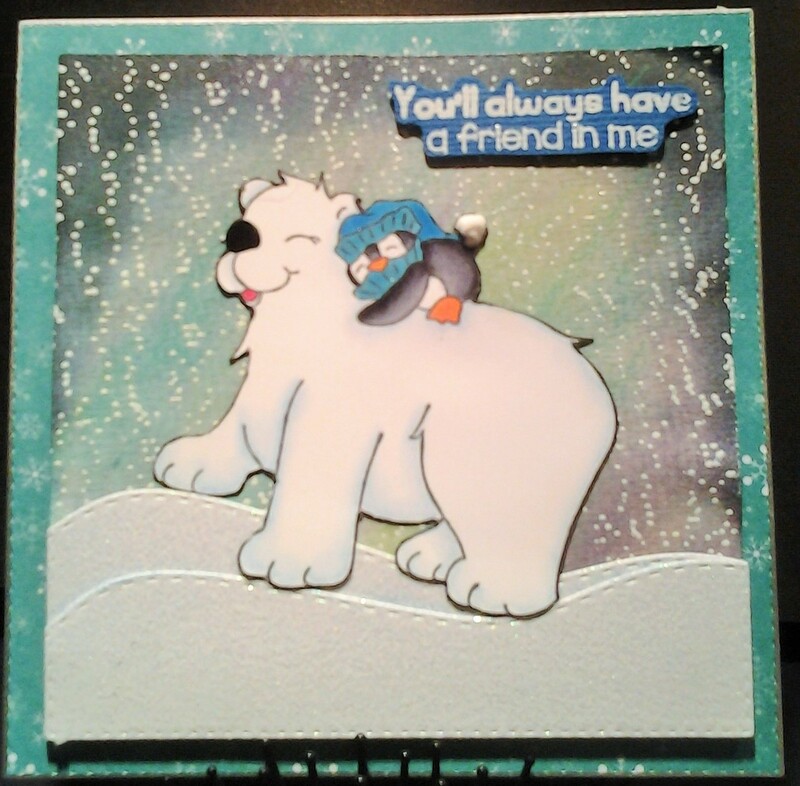 Sentiment – Craftin Desert Diva’s – Polar Pals. Embossed with VersaMark and Ranger Embossing Powder White – Extra Fine Detail. I cut using my die cut from Craftin Desert Diva’s – Outdoor Landscape Dies. Snow on ground is Recollections Christmas Ink Jet Printable Glitter Paper. Square cuts are from My Creative Time – Stitched Squares Inside and Out. Snow falling is made from Craftin Desert Diva’s – Across the Border stamp, VersaMark and Ranger Embossing Powder White – Extra Fine Detail. Silver Edging around outside of card – Pilot Silver Marker – Medium Point. 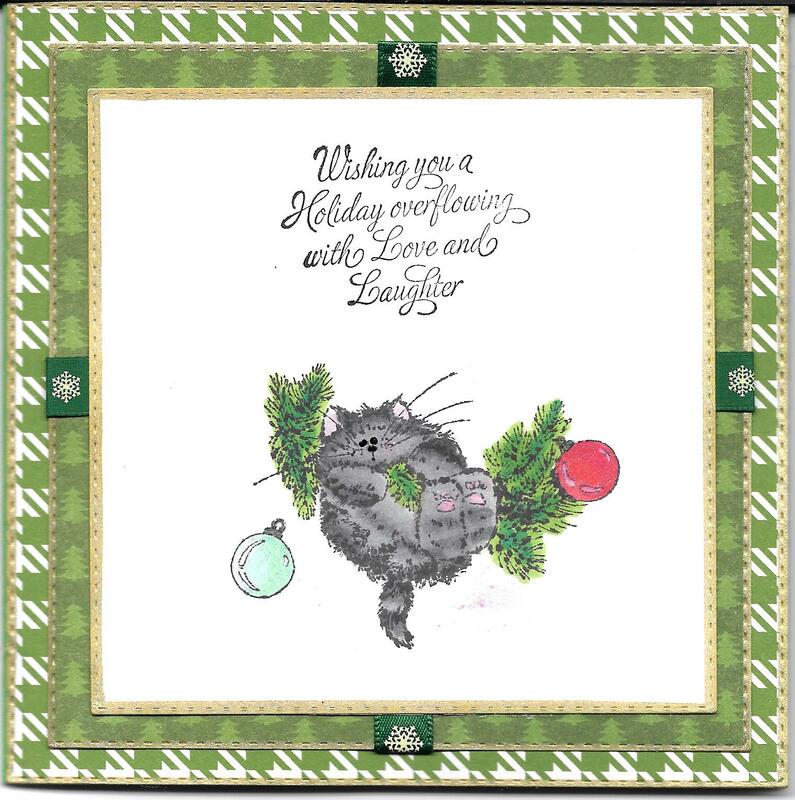 Back to share this year’s card for our vet Dr. Aziz and his wonderful staff from “Boo” our cat. 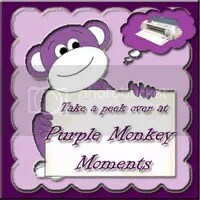 The stamp on the front page is from High Hopes Rubber Stamps – “Wasn’t Me! TT013” by Dina Gerner. The sentiment was typed out on my computer in Word. 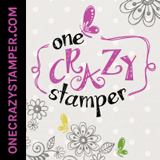 I saw this sentiment at “One Crazy Stamper” on another card created by Sheri Burry and loved it! The image was coloured with my Spectrum Noir markers. Tree: LG2, J3, GT2. EB2, EB4, EB6 and DR6. Christmas Balls – DR6, DR8. PL2, PL3, PL4. CT2, CT4. BT4, BT8. Wink of Stella – Clear. Mouse – TN2, TN3, TN4. Tree Boughs – Tree: LG2, J3, GT2. Christmas Balls – DR6, DR8 and BT4, BT8. Wink of Stella – Clear. IG1 was used for shadow on both images. Made this card to enter into Kadoodle Bug Challenge. To make my card, I used Cricut Design Space and Cricut Explore. 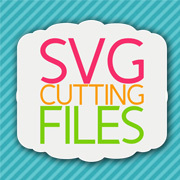 The .svg files for CK Cricut Snowman and CK Cute Little Deer are from Kadoodle Bug Designs. 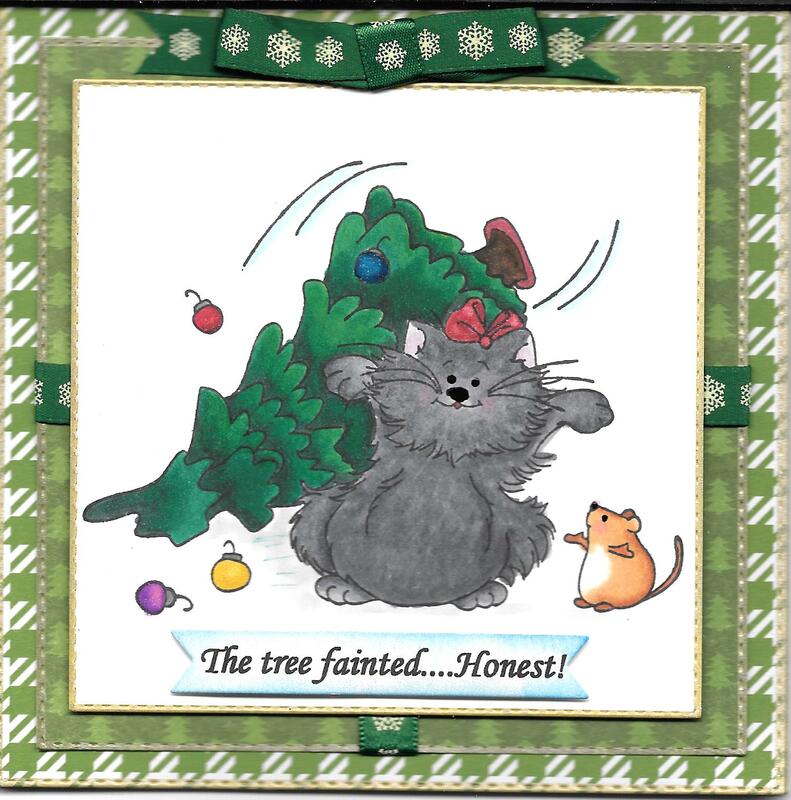 Trees are from Miss Kate Cuttables. Made the snow on ground with Craftin Desert Diva’s – Outdoor Landscape Dies and Recollections Christmas Ink Jet Printable Glitter Paper. Aleene’s Glitter Snow below snowman and reindeer. 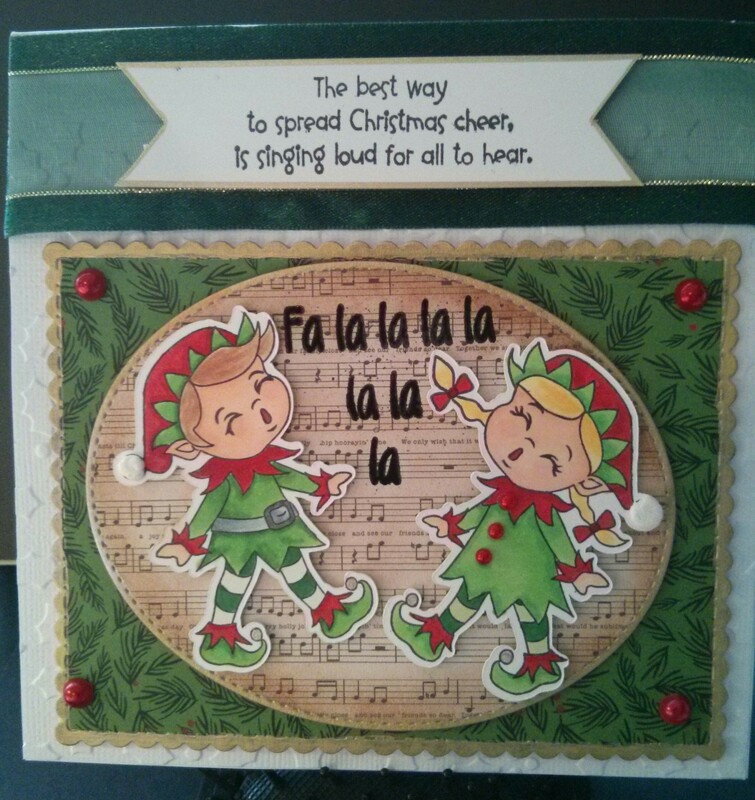 Falling snow – Craftin Desert Diva’s – Across the Borders stamp and Ranger White Embossing Powder – Super Find Detail. Background – Watercolour paper, Tim Holtz Distress Inks – Tumbled Glass, Peacock Feathers, Broken China and Shaded Lilac. Sentiment – Craftin Desert Diva’s – Polar Pals. My Creative Time – Stitched Squares – Inside and Out. Entered into contest – KBD Challenge.